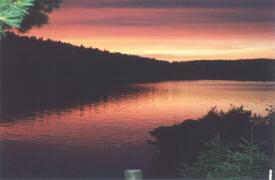 Sherbrooke Lake is one of the largest lakes in N.S. at over 9 miles long and 2 miles wide. Excellent for boating, fishing & water sports. The cottage is located just 1.5 hrs from the Halifax International Airport and 30 minutes from the UNESCO Town of Lunenburg. Lunenburg is the home of the famous schooner Bluenose, a marine museum and many fascinating shops and restaurants. 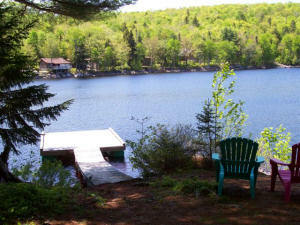 From Sherbrooke Lake you can access over 8 golf courses within an hour's drive. Close to 5 museums, a winery and a short drive to the ocean or beautiful Annapolis Valley. The sunset photo scene above was taken from the lakeshore directly in front of the cottage and we have many other photos available which we can email to you. 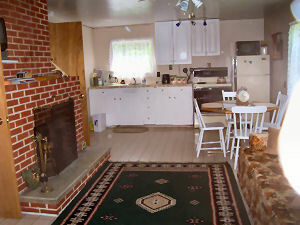 The cottage is fully equipped with all bedding, utensils and linens. It has a canoe, paddelboat, gas bbq, picnic table, and full wrap-around deck. This a great place to spend a weeks vacation !!! 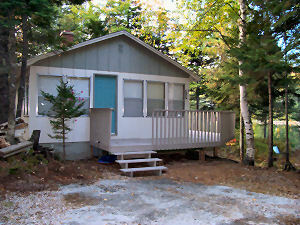 If you are interested in booking a week, pls email or call us at 902 275-3350. Just 4 hours from Heathrow - See how far the Pound goes in beautiful Nova Scotia! Click here for rate in British Pounds.